Dobby loves visitors. He understands the word “visitor,” and I prompt him before their arrival so he knows to expect extra corn new faces. He appreciates all visitors, but I have noticed he has a marked preference for females and is very respectful of very young and very old visitors who are calm, curious, and respectful. Dobby has a reputation for being naughty, but he does have a sweet side and he is very sensitive to the emotional response he triggers in guests. This blog is written by Mclaren, a young visitor who arranged this meeting with Dobby for her younger sister Tatum, an authentic capybara aficionado. She truly captures the mood of first-time guests and possibly presents a more authentic view of Dobby than I do. Certainly he can’t always be as silly as I make him out to be! Dobby; a cute capybara! Here he is eating a piece of corn inside. My sister and I had so much fun feeding him. He is a strong boy! We soon went outside with Dobby. We of course brought the corn. One of his favorites! He is eating it off the table instead of our hands. Dobby loved his own personal hot tub! He got to roll around in it! It was quite an experience seeing a capybara in a pool! That day when we visited Dobby, it was raining, what a treat to be in a warm bath after the cold rain passes. Dobby did lots of fun tricks for us! It was quite a fun show! He liked to touch his nose to the ball and get rewarded with a bite of corn or lettuce. 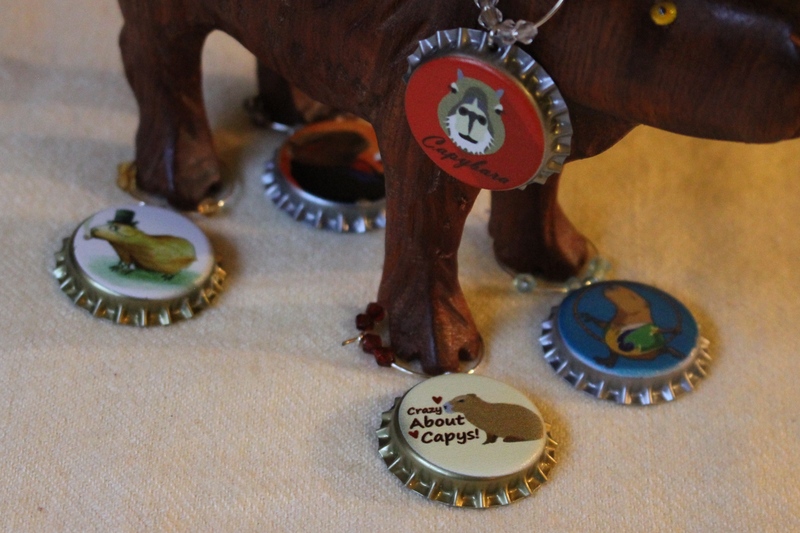 What a good capybara! Dobby was a silly boy! Getting to know his unique personality was quite a treat! He was very funny and very photogenic. We loved meeting Dobby! Dobby’s other favorite was lettuce! He was very fond of this treat! Dobby liked a good scratch! He laid down and let Stacy scratch his belly. He was very sweet and knew who he could trust. Thank you Dobby and Stacy! My sister and I had a wonderful time visiting Dobby! Thank you and best wishes to you and Dobby! Thank you Mclaren and Tatum! If you would like to visit Dobby, please visit the Stacy’s Funny Farm website. It would be the best day ever to be able to kiss Dobby on his sweet nose! Love your blog – love Dobby! good blog! I’m sure Dobby was well-behaved for the visitors! The beastie soaking in the hot tub is the BEST!!! Glad you had a good visit!! Good blog! I’m sure Dobby was extra well-behaved for his visitors! The beastie in the hot tub is the BEST! Glad you had a good visit — thanks for writing about your experience!! I hope to visit Dobby someday! I am an excellent capy scratcher! Enter your email address to follow this blog and get Dobby News delivered via email.